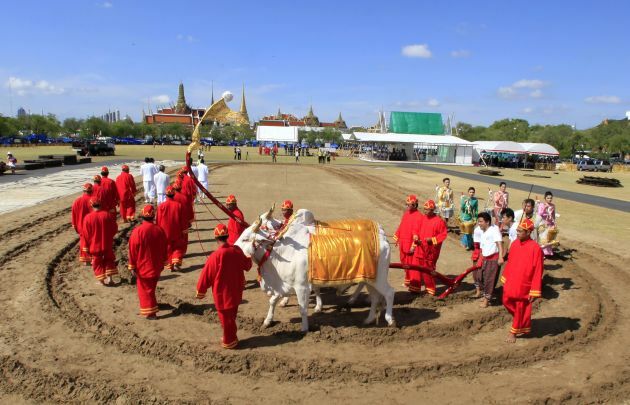 The Royal Ploughing Ceremony is called พระราชพิธีพืชมงคล /Pra Ratchapitii Puetchamongkon/. It is an ancient royal rite held in Cambodia and Thailand to mark the traditional beginning of the rice-growing season and ensure fertility of crops. The ceremony has been performed in Thailand since the Sukhothai period, some 700 years ago, and is closely watched by farmers across the country. The Royal Ploughing Ceremony is deemed a vital event by Thai farmers for their agricultural fortune, signifies one of the prominent traditional features of Thailand’s cultural identity. 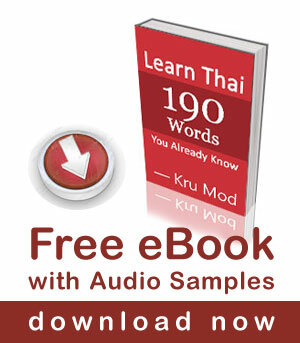 The date is usually in May, but varies as it is determined by Hora (astrology) (Thai: โหราศาสตร์ /horasat/). This year, the ceremony and public holiday falls on 9th May 2016. The ceremony was presided over by His Royal Highness Crown Prince Maha Vajiralongkorn. 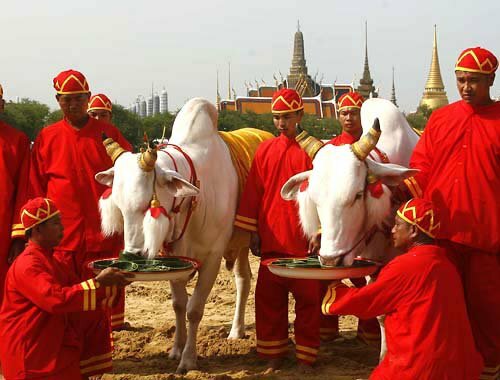 In the ceremony, two sacred oxen are hitched to a wooden plough and they plough a furrow in some ceremonial ground, while rice seed is sown by court Brahmins (พราหมณ์ /praam/). After the ploughing, the oxen are given a choice of seven types of food and drinks (grass, rice seeds, maize, sesame seeds, beans, water and liquor). The ones they select will determine how rich the crop is going to be the coming year. This year, the oxen ate rice, sesame, water and rice liquor. Water (น้ำ náam) – the rainfall will be average. Rice liquor (เหล้า lâo) – transportation will be boost and the economy will be prosper. Meanwhile, the Lord of the Plough (พระยาแรกนาขวัญ) has picked a piece of cloth measuring five palms. The length of the cloth indicated that rice will be abundant, fruit and animal meat will be bountiful. After the ceremony at Sanam Luang, some of the rice seed were strewn over the ceremonial ground and some of them are taken to the experimental rice growing station at the palace ground of Chitralada Villa. This royal residence will provide the grounds for the seeds to be planted for next year’s ceremony. In the end, the crowd rushed to gather the rest of the seeds up. The ceremonial grains are considered an auspicious start to the rice planting season. Some people sell them. The price is said to be about 10 baht a grain in rural areas. Authorities prepared grain from 11 rice species totalling 2,520 kg for distribution to farmers and people participating in the annual ceremony.